Before one starts to read, it should be noted that all textures are mostly place holders until our artist can create some. Also only a very simple map and hud have been added so far. We are creating this game using LibGDX, mostly because we want to create for Android and IOs at the same time. The game is based around two modes. In the map there will be placed resources that can be mined, and objects that need to be removed. 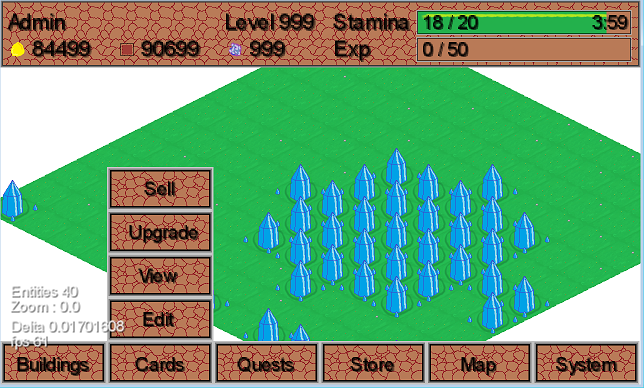 Adventure mode: In this mode you use your resources to buy packs of cards and have card battles. Right now, nothing has been created for this, so all combat mechanics are still in the air, and not much has been decided yet. End goal is to have something similar to "Magic the Gathering" but with some changes, but not sure yet still being discussed. As battles are fought stamina is gained and exp is earned. Stamina regenerates over time, even if the player inst in the game. Also I know this post does little justice to our actually idea for the game, but until we have it working 100% this will have to do. This honestly seems like you're trying to make a game that's practically owned by Zynga. While it's good for a first project, you have to keep things in mind that it's more than likely not going to attract very many people unless you were just in the right time at the right place. The only thing that I can see that's differentiating your game from previously made ones is the card system. The card system being implemented with the building system is something that I'd like to see. I would probably play just for the soul purpose of checking it out. However! Try to create an aspect of the game that can be played even when you're out of stamina, perhaps ways to earn stamina through minigames, etc. That'd be cool, IMO. As battles are fought stamina is gained and exp is earned. Stamina regenerates over time, even if the player inst in the game. Completely overlooked this while making my comment. I think this could go places. Sorts(Places them in the correct order so overlap works) all "Buildings"
Currently the card battle will work that a player will have a 3 card hand, those cards are then placed in one of 5 slots on their "field". If an enemy places a card in the opposing slot, the two cards will fight, untill one or both die. If a card has no opposition it will deal one point of damage to the opponent. Each turn you get more cards, this goes on until someone's life hits zero. Looks awesome for a first game, best of luck!